A souq or souk (also spelled soq, souk, esouk, suk, sooq, souq, or suq) is an open-air marketplace or commercial quarter in an Arab, or Berber city. 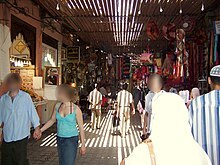 A souk or souq is a free-market where vendors can say the going market price for their products. The term is often used for the market in any Arab or Muslim city. In modern times, it appears in Western cities, too. It may also be the weekly market in some smaller towns where no tribal conflicts would be allowed. This page was last changed on 12 October 2018, at 03:00.